Warwickshire chief executive Neil Snowball hopes that hosting two men's and women's Birmingham Bears Twenty20 matches on the same day at Edgbaston can help the women's game grow. The women's team play Nottinghamshire on 19 June prior to the men's side taking on T20 champions Lancashire. And before Ian Bell's men's team face Leicestershire on 17 July, the women's side will again be in action. "We hope it inspires more girls to get involved in cricket," said Snowball. 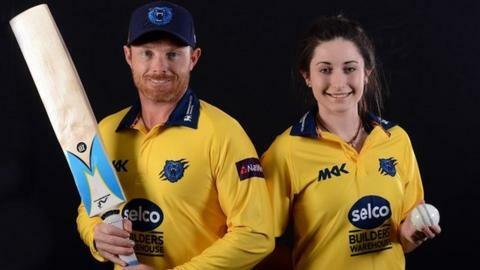 The Birmingham Bears ladies, who finished runners-up in last summer's NatWest Women's T20 league, were one of the bidders for a place in this summer's inaugural Women's Cricket Super League. They missed out when Loughborough University were chosen to be the only hosts in the Midlands. "Whilst we were disappointed to miss out on hosting a team in the new Women's Super League, we're committed to growing the women's game," added Snowball. "The two T20 double-headers are a great step for the club. Not only will it provide our women's team with a chance to play in front of a big crowd at an international venue, we hope that this initiative helps our grassroots development of the game." Edgbaston was the host ground for a similar venture at international level in 2014, when England's women's team played South Africa prior to the men's team playing India. But it is understood that the Bears, T20 champions in 2014, are the first to attempt to sell the women's game in such a way at county level. "It's fantastic to see this type of inclusive thinking from a county with a strong T20 record," said England and Wales Cricket Board director of England women's cricket Clare Connor. "I'm sure that these double-headers will be the highlight of the season for Birmingham Bears Women. "Hopefully they will also provide great opportunities through which the club can drive some exciting community initiatives to inspire female participation at local, grassroots level in the region."